iPhone - Open Safari and goto https://app.webelect.net (make sure you are not in Private browsing mode). Click the Sharing icon and select to Add To Homescreen from the list. Android - Open Chrome and goto https://app.webelect.net and click the Chrome menu icon and the select to Add To Homescreen. We have released a version of the app that does not require the Apple App Store or Google Play and contains several improved features (technically this is called an HTML5 WebApp ). Because it is not an update to the existing app, you should remove the existing version prior to installing the new version as the home screen icons look the same. The new app requires you to provide the server generated App PIN code to link to your user account. You can find that, along with the installation instructions, by logging into webElect and clicking the "Change Info/Password" link on the Main Menu. The PIN is also provided in the Welcome email you received when first setup as a user in webElect. You may also have the PIN emailed to you by clicking the "Email it to me" link on the app's login page. Note that the videos below will be updated to reflect the new app versions. 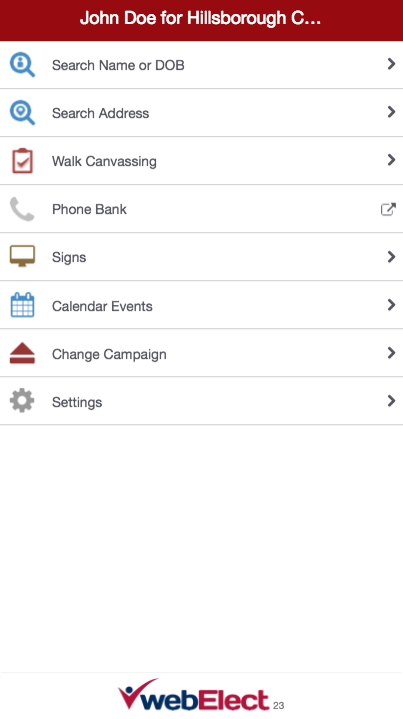 The mobile app is part of the Sign Delivery and Walk/Canvassing action lists module.